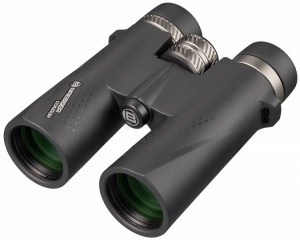 The Bresser Condor 8x42 are extremely versatile binoculars - waterproof, nitrogen-filled, handy and high-quality processed. With the rotatable and lockable eyecups can adjust the eye distance for the observation with and without glasses; a dioptric correction is standard. Featuring BaK-4 prisms with a special UR coating that brings even more light to your eye. All lenses are fully multi-layer coated. In addition, the eyepieces and focus wheel are made of sturdy metal. The 8x42 with higher light gathering power; They offer a brighter picture, especially in the beginning twilight than other models with 42mm opening. Thanks to the opening of 42mm and the not too large housing, the 8x42 and 10x42 binoculars are the perfect companion in many situations. Whether hiking or in the woods. Here you get the optimal combination to be versatile. All binoculars of the Condor series have the premium guarantee from BRESSER, which ensures the all-round carefree package. If you ever have problems with the glass we will help you. Whether you have it in debt or not. We do not let you alone!